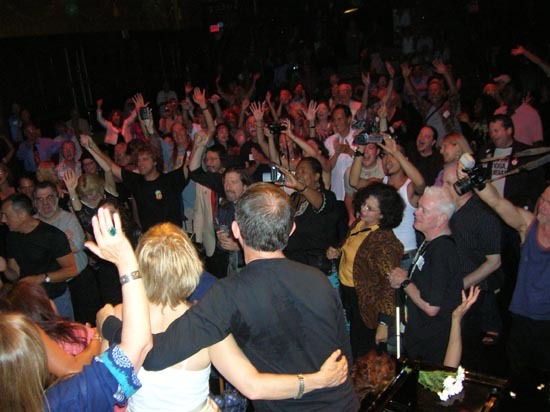 On Saturday, September 10, 2005 several hundred Hair alumni gathered at La MaMa, e.t.c in New York City for the first international reunion of Hair alumni. People came from New York, California (north and south), Washington state, Texas, Florida, Vermont, Maine, Massachusetts, Connecticut, New Hampshire, Missouri, Oregon, Nevada, and even Alaska! Alumni from every first run US company, and quite a few from European companies (Germany, Spain, Amsterdam, London) attended. Alumni from all production capacities were there including on stage, backstage, office, creative team, fans, concession, and their friends and family. We sang, we danced, we saw old friends and a transcendent, wonderful time was had by all!